If there’s one word that is often associated with movies, it’s “magical.” After all, cinema is a medium that allows all the dreams of our imagination to come to life on the big screen. Special effects can give actors superpowers, or transport the audience to worlds filled with strange and mystical creatures. Many people use movies as an escape from their ordinary lives. Perhaps that’s why magic is so appealing. Magic allows people to do things that they usually cannot. It enables them to overcome obstacles that would otherwise be impossible to move. As such, wizards can be such fascinating topics for films. This week’s two movies highlight a classic wizard and perhaps the best-known wizard of all time. 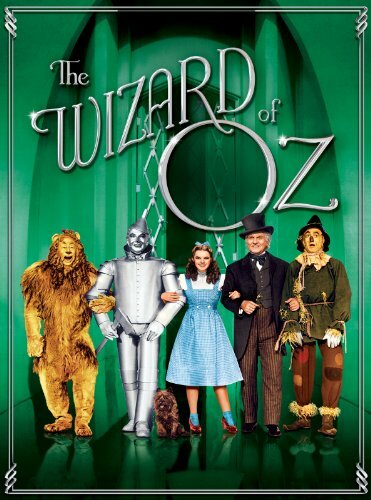 The Wizard of Oz (1939) is one of those movies that is so ingrained in our society’s popular culture, that we sometimes forget some of the aspects of this film are not normal. I mean, scarecrows don’t really talk or walk or wish for brains (zombies might, but they don’t exist either). Furthermore, and more to the point, the secondary plot of this film (the first being a girl’s wish to go home) is a battle between witches and wizards. And though the film version of the story makes the whole endeavor merely the comatose dream of a Kansas farm girl, there are undoubtedly many magical influences throughout. After Dorothy (Judy Garland) is whisked away by a tornado to the colorful world of Oz, she finds that she has literally dropped into the middle of a feud between directional witches. When her house lands on the evil Witch of the East, she acquires the witch’s magical ruby red slippers. Of course, Dorothy isn’t interested in her shiny new shoes, and she asks Glinda, the Good Witch of the North (Billie Burke) how she can get home. Glinda directs Dorothy to take the yellow brick road to the Emerald City, where there lives a mighty and powerful wizard. However, the Wicked Witch of the West (Margaret Hamilton) wants her sister’s ruby slippers and sets out to get them from Dorothy. Upon arriving at the Emerald City, the Wizard of Oz (Frank Morgan) sends Dorothy out to take care of the Wicked Witch, which now means that she and her acquired friends now need to travel to the witch’s castle, fending off flying monkeys in the process. Eventually, Dorothy defeats the witch and heads back to the Emerald City to get her wish granted by the Wizard of Oz. In a twist, Glinda appears and reveals that Dorothy had the power to go home with her the entire time. How convenient. J.K. Rowling’s iconic series about wizards and witches turned many people on to reading. As is the case with any successful literary series, they are eventually turned into movies. And while I normally limit each week to two movies, we need to consider both films to arrive at a complete narrative. Through the course of six books/movies, we have watched Harry Potter (Daniel Radcliffe) grow up from a pre-teen to the one person who can save the world from the evil Lord Voldemort (Ralph Fiennes). I am almost certain that if you were to tell someone to say the first thing that popped in their head after hearing the word “Wizard,” it would be “Harry Potter” (with the above Wizard of Oz perhaps being one of the few exceptions). 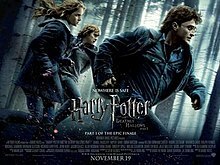 The penultimate conclusion of the Harry Potter series, Harry Potter and the Deathly Hallows (2010) follows Harry his friends, Hermione Granger (Emma Watson) and Ron Weasley (Rupert Grint), as they search for the pieces of Lord Voldemort’s soul known as Horcruxes in order to extinguish the evil wizard’s immortality. Meanwhile, Voldemort is planning an attack on Hogwarts, the only bastion that stands against him and his ability to rule the world of magic. In the first film (Part 1), we learn of the Deathly Hallows, which are the keys that will assist in defeating Lord Voldemort. During the second film (Part 2), the battle between Voldemort’s forces and the entire school of Hogwarts begins as Harry and his friends race to destroy the final Horcruxes and end Voldemort’s reign of terror.